Xu Zhangrun (許章潤, 1962-) is a professor of law at Tsinghua University in Beijing. In a series of major essays published from early 2016 to early 2019, Professor Xu questioned at length, and in detail, the political, economic and cultural trajectory of the People’s Republic of China under Xi Jinping, the leader of the nation’s party-state-army. Profoundly concerned by a change to the constitution that garnered near universal approval from China’s legislature in March 2018 that granted Xi Jinping what is, for all intents and purposes, lifetime tenure as head of the nation’s party-state, Professor Xu felt compelled to speak out in an even more pointed manner. In late July 2018, Xu published ‘Imminent Fears, Immediate Hopes’ — a Beijing Jeremiad 我們當下的恐懼與期待 (an annotated draft translation appeared in China Heritage on 1 August 2018). In this 10,000 word article — one written in a succinct and powerful form of literary Chinese — Xu not only questioned the Xi Jinping ‘dispensation’, he also offered concrete policy suggestions to counter the authoritarian revanchism of Xi’s ‘New Epoch’ 新時代. In a series of three interconnected works published from December 2018 to January 2019, Xu offered an overview of modern Chinese history, the role played in it by the Communist Party over the past seventy years, and the threat that it now poses not only to the continued modernisation of the country as it continues its struggle to become an equitable and responsible nation-state. He also alerted readers to the looming threat that China under Xi Jinping signifies for the international community. Since mid 2018, Professor Xu’s works have generated widespread discussion — and sotto voce debate — in China; they have also attracted international attention. In late March 2019, the Communist Party Committee that administers Tsinghua University, Xu Zhangrun’s employer, informed him via the university’s Human Resources Office that his wages would be further reduced; that he was stripped of all of the duties and privileges as a professor at Tsinghua, effective immediately; and, that a formal Investigation Group would scruitinise in detail his activities and writings. Those investigation would inform the Party bosses, both at Tsinghua and in Zhongnanhai, how he would be further disciplined, cashiered or legally sanctioned. Tsinghua University’s actions elicited an immediate response among some of Xu Zhangrun’s colleague, ranging from disbelief to outrage. The news also caused consternation among many Tsinghua graduates and within the wider community. We have translated some of those reactions below (see ‘Xu Zhangrun vs. Tsinghua University’). In the persecution of Xu Zhangrun, which began surreptitiously at the behest of Chinese officialdom in August 2018, some of the country’s leading academics and intellectuals identify a ‘case study’ in the broader malaise affecting the country’s educational and cultural life. For years, it has been widely recognised that even the limited intellectual freedoms tolerated under previous Communist Party leaders were under increased threat as a result of the implementation of revived ideological controls throughout the publishing, academic and cultural spheres. With the circulation in 2013 of ‘Document Number Nine’, which alerted Party members about the infiltration of potentially destabilising ‘Western Values’, and in light of the trial and jailing in September 2014 of the respected, and moderate, Uyghur academic Ilham Tohti, even relatively naïve and hopeful independent-minded educators in the country’s universities and schools became tremulously aware of a rising tide of Communist Party obscurantism. As we have repeatedly observed in China Heritage, however, the origins of the escalating crisis in Chinese education and culture has its origins in 1978. At that time, just as the Communists formally recognised the disaster their rule had visited upon the country and made a series of decisions that would form the basis of the four decades of what is known as Economic Reform and Global Openness 改革開放, they also made a fateful adjudication: at the urging of Deng Xiaoping, Hu Qiaomu and other ideologues it was decided that the repression of outspoken academics, intellectuals and others in 1957, known as the ‘Anti-Rightist Campaign’ was, in essence, correct. Although over 300,000 men and women unjustly persecuted due to that campaign were eventually exonerated, the charges against five ‘Rightists’ were upheld and used as an excuse to justify the purge, one that had been overseen by Mao Zedong and coordinated by the logistical genius, Deng Xiaoping. The affirmation of the political necessity of the 1957 purge of intellectual and cultural life — along with the Thought Reform Movement of the early 1950s that initially crushed academic freedom (for more on this, see ‘Ruling The Rivers & Mountains’) — has repeatedly given the Party ideological license to police university life as it sees fit. In re-imposing stricter ideological controls on education, and particular in tertiary educational institutions, Xi Jinping’s party-state has merely been exercising prerogatives long ago made possible by major Party decisions announced in 1978, in 1987, and again after 4 June 1989 and repeatedly since then. The ‘Xu Zhangrun Incident’, as some call it, is not merely about intellectual and academic freedom. Rather, it reflects the Xi-generated crisis in China’s ability to think about, debate and formulate ideas free of Communist Party manipulation, ideas that rightful could and should benefit Chinese society, the nation and the world as a whole. ‘The Xu Zhangrun Archive’, or ‘Xu Case File’ — which is located under Projects in the menu bar of China Heritage — offers some of the key works in Professor Xu’s recent oeuvre, as well as a sample of reactions to those works and an overview of his ongoing persecution. New material will be added to the Archive as it becomes available. My thanks, as always, to Reader #1 who, despite being cloaked in anonymity, graces this work in a most visible way: by alerting me to embarrassing typographical errors, as well as by making timely and felicitous suggestions that have improved these translations. 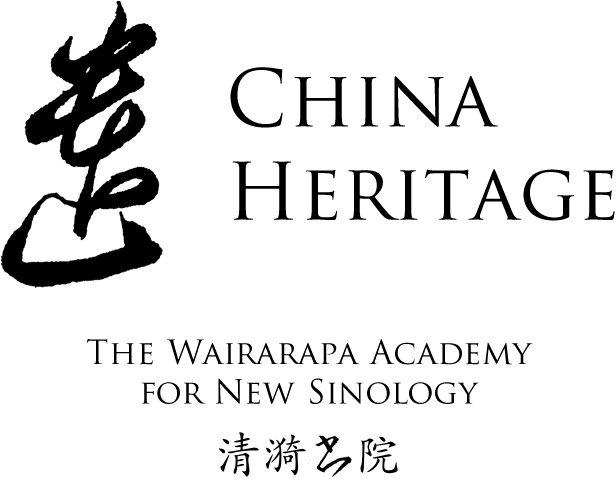 China Heritage, which was launched in December 2016, is also the online home of The Wairarapa Academy for New Sinology 白水書院, conceived by John Minford and Geremie R. Barmé, and its projects. The Academy is based in Wairarapa, New Zealand. Its ‘sororal site’, China Heritage Annual, was launched in March 2017, and A New Sinology Reader is in development. For more about the China Heritage site, see here; for the Rationale behind this site, see here; and for material related to New Sinology 後漢學, the approach that underpins our endevours, see here. The work of China Heritage is self-funded: We are indebted to none and beholden to no one. 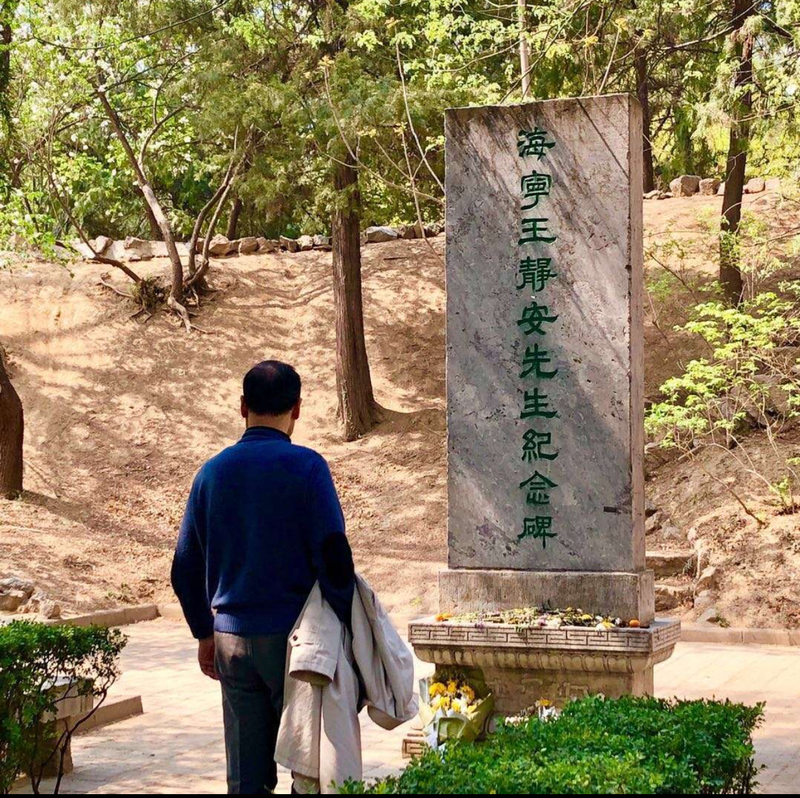 Xu Zhangrun at the stele commemorating Wang Guowei — a scholar celebrated for possessing ‘A Spirit Unfettered and a Mind Independent’ 獨立之精神, 自由之思想 — on the campus of Tsinghua University, n.d.
From December 2018 to January 2019, Xu Zhangrun published three long, interconnected essays to commemorate the fortieth anniversary of the launch of what are know as China’s ‘Reform and Openness’ policies. Those essays are being translated with annotations in China Heritage in twelve parts. Only three of those twelve chapters have been published to date.